Dopamine creates the feeling of excitement when you anticipate a new way to meet a need, but you have power over the way you define that. This podcast is a live call-in with Loretta Breuning, PhD, author of Habits of a Happy Brain: Retrain your brain to boost your serotonin, dopamine, oxytocin and endorphin levels. Questions? InnerMammalInstitute.org/podcast. Happiness is caused by four special brain chemicals: dopamine, serotonin, oxytocin, and endorphin. When you know how they work in animals, you can find your power over them in daily life. The happy chemicals are not designed to flow all the time for no reason. They evolved to reward behaviors that promote survival in the state of nature. They are only released in short spurts, so you always have to do more to get more. This makes life frustrating! Our chemicals are controlled by neural pathways built from life experience. Neurons connect when your happy chemicals flow, which wires you to repeat behaviors that felt good before. Fortunately, you can re-wire yourself, but it’s not easy. That’s why we keep discussing and asking questions. The Inner Mammal Institute has resources that help you make peace with your inner mammal: books, videos, blogs, graphics, and podcasts. You’ll find out what turns on your happy chemicals in the state of nature, and how you can turn them on today. InnerMammalInstitute.org It’s not easy being mammal! But you can build your power over your mammalian brain chemicals. Listen! Read! Join the conversation! Music from Sonatina Soleil by W.M. Sharp. Hear more of it at InnerMammalInstitute.org/musicbywmsharp. The social-confidence strategies of Dr. Aziz fit so well with the Inner Mammal method, but I ask him a lot of hard questions! Loretta Breuning answers readers questions about the brain chemicals that make us feel good. If you have more questions, check out the Inner Mammal Institute, read Habits of a Happy Brain, and then contact Dr Breuning to ask your questions on the show! Happiness is caused by four special brain chemicals: dopamine, serotonin, oxytocin, and endorphin. When you know how they work in animals, you can find your power over them in daily life. The happy chemicals are not designed to flow all the time for no reason. They evolved to reward behaviors that promote survival in the state of nature. They are only released in short spurts, so you always have to do more to get more. This makes life frustrating! Our chemicals are controlled by neural pathways built from life experience. Neurons connect when your happy chemicals flow, which wires you to repeat behaviors that felt good before. Fortunately, you can re-wire yourself, but it’s not easy. That’s why we keep discussing and asking questions. The Inner Mammal Institute has resources that help you make peace with your inner mammal: books, videos, blogs, graphics, and podcasts. You’ll find out what turns on your happy chemicals in the state of nature, and how you can turn them on today. It’s not easy being mammal! But you can build your power over your mammalian brain chemicals. People hope to eat their way to happiness in different ways, but we’re better off understanding why our brain is so obsessed with food. Loretta Breuning answers readers questions about the brain chemicals that make us feel good. If you have more questions, check out the Inner Mammal Institute, read Habits of a Happy Brain, and then contact Dr Breuning to ask your questions on the show! Happiness is caused by four special brain chemicals: dopamine, serotonin, oxytocin, and endorphin. When you know how they work in animals, you can find your power over them in daily life. The happy chemicals are not designed to flow all the time for no reason. They evolved to reward behaviors that promote survival in the state of nature. They are only released in short spurts, so you always have to do more to get more. This makes life frustrating! Our chemicals are controlled by neural pathways built from life experience. Neurons connect when your happy chemicals flow, which wires you to repeat behaviors that felt good before. Fortunately, you can re-wire yourself, but it’s not easy. That’s why we keep discussing and asking questions. The Inner Mammal Institute has resources that help you make peace with your inner mammal: books, videos, blogs, graphics, and podcasts. You’ll find out what turns on your happy chemicals in the state of nature, and how you can turn them on today. It’s not easy being mammal! But you can build your power over your mammalian brain chemicals. Giving up can be a fear of criticism or a good decision about the best way to invest your energy; here’s how to tell the difference, and some great listener questions about self-confidence, status, and compassion. This podcast is a live call-in with Loretta Breuning, PhD, author of Habits of a Happy Brain: Retrain your brain to boost your serotonin, dopamine, oxytocin and endorphin levels. Questions? InnerMammalInstitute.org/podcast. Happiness is caused by four special brain chemicals: dopamine, serotonin, oxytocin, and endorphin. When you know how they work in animals, you can find your power over them in daily life. The happy chemicals are not designed to flow all the time for no reason. They evolved to reward behaviors that promote survival in the state of nature. They are only released in short spurts, so you always have to do more to get more. This makes life frustrating! Our chemicals are controlled by neural pathways built from life experience. Neurons connect when your happy chemicals flow, which wires you to repeat behaviors that felt good before. Fortunately, you can re-wire yourself, but it’s not easy. That’s why we keep discussing and asking questions. The Inner Mammal Institute has resources that help you make peace with your inner mammal: books, videos, blogs, graphics, and podcasts. You’ll find out what turns on your happy chemicals in the state of nature, and how you can turn them on today. It’s not easy being mammal! But you can build your power over your mammalian brain chemicals. Listen! Read! Join the conversation! Music from Sonatina Soleil by W.M. Sharp. Hear more of it at InnerMammalInstitute.org/musicbywmsharp. The academic view of the brain is filtered through the presumption that effortless happiness is the state of nature and “our society” is the cause of all unhappiness. This podcast is a live call-in with Loretta Breuning, PhD, author of Habits of a Happy Brain: Retrain your brain to boost your serotonin, dopamine, oxytocin and endorphin levels. Questions? InnerMammalInstitute.org/podcast. Happiness is caused by four special brain chemicals: dopamine, serotonin, oxytocin, and endorphin. When you know how they work in animals, you can find your power over them in daily life. The happy chemicals are not designed to flow all the time for no reason. They evolved to reward behaviors that promote survival in the state of nature. They are only released in short spurts, so you always have to do more to get more. This makes life frustrating! Our chemicals are controlled by neural pathways built from life experience. Neurons connect when your happy chemicals flow, which wires you to repeat behaviors that felt good before. Fortunately, you can re-wire yourself, but it’s not easy. That’s why we keep discussing and asking questions. The Inner Mammal Institute has resources that help you make peace with your inner mammal: books, videos, blogs, graphics, and podcasts. You’ll find out what turns on your happy chemicals in the state of nature, and how you can turn them on today. It’s not easy being mammal! But you can build your power over your mammalian brain chemicals. Listen! Read! Join the conversation! Music from Sonatina Soleil by W.M. Sharp. Hear more of it at InnerMammalInstitute.org/musicbywmsharp. The roots trip I took to explore my early wiring, and questions about building a strong spine vs external armor when dealing with people who get on your nerves. This podcast is a live call-in with Loretta Breuning, PhD, author of Habits of a Happy Brain: Retrain your brain to boost your serotonin, dopamine, oxytocin and endorphin levels. Questions? InnerMammalInstitute.org/podcast. Happiness is caused by four special brain chemicals: dopamine, serotonin, oxytocin, and endorphin. When you know how they work in animals, you can find your power over them in daily life. The happy chemicals are not designed to flow all the time for no reason. They evolved to reward behaviors that promote survival in the state of nature. They are only released in short spurts, so you always have to do more to get more. This makes life frustrating! Our chemicals are controlled by neural pathways built from life experience. Neurons connect when your happy chemicals flow, which wires you to repeat behaviors that felt good before. Fortunately, you can re-wire yourself, but it’s not easy. That’s why we keep discussing and asking questions. The Inner Mammal Institute has resources that help you make peace with your inner mammal: books, videos, blogs, graphics, and podcasts. You’ll find out what turns on your happy chemicals in the state of nature, and how you can turn them on today. It’s not easy being mammal! But you can build your power over your mammalian brain chemicals. Listen! Read! Join the conversation! Music from Sonatina Soleil by W.M. Sharp. Hear more of it at InnerMammalInstitute.org/musicbywmsharp. The mammal brain focuses on the survival of your unique individual essence, so it is terrified by the human brain’s awareness of mortality until you soothe it with thoughts of a legacy. 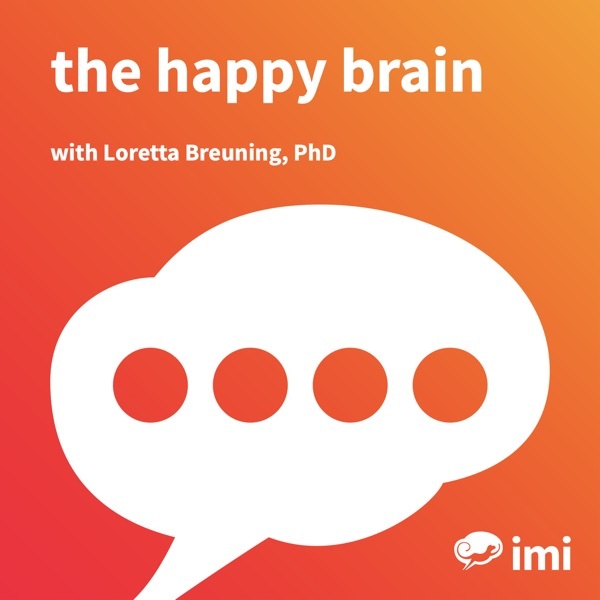 This podcast is a live call-in with Loretta Breuning, PhD, author of Habits of a Happy Brain: Retrain your brain to boost your serotonin, dopamine, oxytocin and endorphin levels. Questions? InnerMammalInstitute.org/podcast. Happiness is caused by four special brain chemicals: dopamine, serotonin, oxytocin, and endorphin. When you know how they work in animals, you can find your power over them in daily life. The happy chemicals are not designed to flow all the time for no reason. They evolved to reward behaviors that promote survival in the state of nature. They are only released in short spurts, so you always have to do more to get more. This makes life frustrating! Our chemicals are controlled by neural pathways built from life experience. Neurons connect when your happy chemicals flow, which wires you to repeat behaviors that felt good before. Fortunately, you can re-wire yourself, but it’s not easy. That’s why we keep discussing and asking questions. The Inner Mammal Institute has resources that help you make peace with your inner mammal: books, videos, blogs, graphics, and podcasts. You’ll find out what turns on your happy chemicals in the state of nature, and how you can turn them on today. It’s not easy being mammal! But you can build your power over your mammalian brain chemicals. Listen! Read! Join the conversation! Music from Sonatina Soleil by W.M. Sharp. Hear more of it at InnerMammalInstitute.org/musicbywmsharp. Your mirror neurons activate when you see someone else enjoy a reward or risk harm; thus, your happy circuits are influenced by those around you, and your happy circuits were shaped by those you mirrored in youth. This podcast is a live call-in with Loretta Breuning, PhD, author of Habits of a Happy Brain: Retrain your brain to boost your serotonin, dopamine, oxytocin and endorphin levels. Questions? InnerMammalInstitute.org/podcast. Happiness is caused by four special brain chemicals: dopamine, serotonin, oxytocin, and endorphin. When you know how they work in animals, you can find your power over them in daily life. The happy chemicals are not designed to flow all the time for no reason. They evolved to reward behaviors that promote survival in the state of nature. They are only released in short spurts, so you always have to do more to get more. This makes life frustrating! Our chemicals are controlled by neural pathways built from life experience. Neurons connect when your happy chemicals flow, which wires you to repeat behaviors that felt good before. Fortunately, you can re-wire yourself, but it’s not easy. That’s why we keep discussing and asking questions. The Inner Mammal Institute has resources that help you make peace with your inner mammal: books, videos, blogs, graphics, and podcasts. You’ll find out what turns on your happy chemicals in the state of nature, and how you can turn them on today. It’s not easy being mammal! But you can build your power over your mammalian brain chemicals. Listen! Read! Join the conversation! Music from Sonatina Soleil by W.M. Sharp. Hear more of it at InnerMammalInstitute.org/musicbywmsharp. Research perspectives on boosting oxytocin with Paul Zak, Center for Neuroeconomic Studies with Loretta Breuning, PhD. Happiness is caused by four special brain chemicals: dopamine, serotonin, oxytocin, and endorphin. When you know how they work in animals, you can find your power over them in daily life. The happy chemicals are not designed to flow all the time for no reason. They evolved to reward behaviors that promote survival in the state of nature. They are only released in short spurts, so you always have to do more to get more. Our chemicals are controlled by neural pathways built from life experience. Neurons connect when your happy chemicals flow, which wires you to repeat behaviors that felt good before. Fortunately, you can re-wire yourself, but it’s not easy. That’s why we keep discussing and asking questions. The Inner Mammal Institute has resources that help you make peace with your inner mammal: books, videos, blogs, graphics, and podcasts. You’ll find out what turns on your happy chemicals in the state of nature, and how you can turn them on today. It’s not easy being mammal! But you can build your power over your mammalian brain chemicals. Music from Sonatina Soleil by W.M. Sharp. Hear more of it at InnerMammalInstitute.org/musicbywmsharp. Happy chemicals naturally droop after they spurt. Questions about the “after the party” letdown feeling, about food obsessions, and about classical virtues. This podcast is a live call-in with Loretta Breuning, PhD, author of Habits of a Happy Brain: Retrain your brain to boost your serotonin, dopamine, oxytocin and endorphin levels. Questions? InnerMammalInstitute.org/podcast. Happiness is caused by four special brain chemicals: dopamine, serotonin, oxytocin, and endorphin. When you know how they work in animals, you can find your power over them in daily life. The happy chemicals are not designed to flow all the time for no reason. They evolved to reward behaviors that promote survival in the state of nature. They are only released in short spurts, so you always have to do more to get more. This makes life frustrating! Our chemicals are controlled by neural pathways built from life experience. Neurons connect when your happy chemicals flow, which wires you to repeat behaviors that felt good before. Fortunately, you can re-wire yourself, but it’s not easy. That’s why we keep discussing and asking questions. The Inner Mammal Institute has resources that help you make peace with your inner mammal: books, videos, blogs, graphics, and podcasts. You’ll find out what turns on your happy chemicals in the state of nature, and how you can turn them on today. InnerMammalInstitute.org It’s not easy being mammal! But you can build your power over your mammalian brain chemicals. Listen! Read! Join the conversation! Music from Sonatina Soleil by W.M. Sharp. Hear more of it at InnerMammalInstitute.org/musicbywmsharp. “Compassion” is a word often used to point blame and avoid responsibility; here’s my take on the problem and my answer to readers’ questions about how to deal with negative people. This podcast is a live call-in with Loretta Breuning, PhD, author of Habits of a Happy Brain: Retrain your brain to boost your serotonin, dopamine, oxytocin and endorphin levels. Questions? InnerMammalInstitute.org/podcast. Happiness is caused by four special brain chemicals: dopamine, serotonin, oxytocin, and endorphin. When you know how they work in animals, you can find your power over them in daily life. The happy chemicals are not designed to flow all the time for no reason. They evolved to reward behaviors that promote survival in the state of nature. They are only released in short spurts, so you always have to do more to get more. This makes life frustrating! Our chemicals are controlled by neural pathways built from life experience. Neurons connect when your happy chemicals flow, which wires you to repeat behaviors that felt good before. Fortunately, you can re-wire yourself, but it’s not easy. That’s why we keep discussing and asking questions. The Inner Mammal Institute has resources that help you make peace with your inner mammal: books, videos, blogs, graphics, and podcasts. You’ll find out what turns on your happy chemicals in the state of nature, and how you can turn them on today. It’s not easy being mammal! But you can build your power over your mammalian brain chemicals. Listen! Read! Join the conversation! Music from Sonatina Soleil by W.M. Sharp. Hear more of it at InnerMammalInstitute.org/musicbywmsharp. Oxytocin causes the good feeling of acceptance and belonging, but that animal urge for safety in numbers causes the frustrating in-group/out-group dynamics of daily life, such as gossip. This podcast is a live call-in with Loretta Breuning, PhD, author of Habits of a Happy Brain: Retrain your brain to boost your serotonin, dopamine, oxytocin and endorphin levels. Questions? InnerMammalInstitute.org/podcast. Happiness is caused by four special brain chemicals: dopamine, serotonin, oxytocin, and endorphin. When you know how they work in animals, you can find your power over them in daily life. The happy chemicals are not designed to flow all the time for no reason. They evolved to reward behaviors that promote survival in the state of nature. They are only released in short spurts, so you always have to do more to get more. This makes life frustrating! Our chemicals are controlled by neural pathways built from life experience. Neurons connect when your happy chemicals flow, which wires you to repeat behaviors that felt good before. Fortunately, you can re-wire yourself, but it’s not easy. That’s why we keep discussing and asking questions. The Inner Mammal Institute has resources that help you make peace with your inner mammal: books, videos, blogs, graphics, and podcasts. You’ll find out what turns on your happy chemicals in the state of nature, and how you can turn them on today. InnerMammalInstitute.org It’s not easy being mammal! But you can build your power over your mammalian brain chemicals. Listen! Read! Join the conversation! Music from Sonatina Soleil by W.M. Sharp. Hear more of it at InnerMammalInstitute.org/musicbywmsharp. Cortisol can spiral when you have many triggers at once – like the time I was triggered by the clutter around my house. This podcast is a live call-in with Loretta Breuning, PhD, author of Habits of a Happy Brain: Retrain your brain to boost your serotonin, dopamine, oxytocin and endorphin levels. Questions? InnerMammalInstitute.org/podcast. Happiness is caused by four special brain chemicals: dopamine, serotonin, oxytocin, and endorphin. When you know how they work in animals, you can find your power over them in daily life. The happy chemicals are not designed to flow all the time for no reason. They evolved to reward behaviors that promote survival in the state of nature. They are only released in short spurts, so you always have to do more to get more. This makes life frustrating! Our chemicals are controlled by neural pathways built from life experience. Neurons connect when your happy chemicals flow, which wires you to repeat behaviors that felt good before. Fortunately, you can re-wire yourself, but it’s not easy. That’s why we keep discussing and asking questions. The Inner Mammal Institute has resources that help you make peace with your inner mammal: books, videos, blogs, graphics, and podcasts. You’ll find out what turns on your happy chemicals in the state of nature, and how you can turn them on today. InnerMammalInstitute.org It’s not easy being mammal! But you can build your power over your mammalian brain chemicals. Listen! Read! Join the conversation! Music from Sonatina Soleil by W.M. Sharp. Hear more of it at InnerMammalInstitute.org/musicbywmsharp. Serotonin creates the feeling of social importance, so how does it affect competitiveness at work? This podcast is a live call-in with Loretta Breuning, PhD, author of Habits of a Happy Brain: Retrain your brain to boost your serotonin, dopamine, oxytocin and endorphin levels. Questions? InnerMammalInstitute.org/podcast. Happiness is caused by four special brain chemicals: dopamine, serotonin, oxytocin, and endorphin. When you know how they work in animals, you can find your power over them in daily life. The happy chemicals are not designed to flow all the time for no reason. They evolved to reward behaviors that promote survival in the state of nature. They are only released in short spurts, so you always have to do more to get more. This makes life frustrating! Our chemicals are controlled by neural pathways built from life experience. Neurons connect when your happy chemicals flow, which wires you to repeat behaviors that felt good before. Fortunately, you can re-wire yourself, but it’s not easy. That’s why we keep discussing and asking questions. The Inner Mammal Institute has resources that help you make peace with your inner mammal: books, videos, blogs, graphics, and podcasts. You’ll find out what turns on your happy chemicals in the state of nature, and how you can turn them on today. InnerMammalInstitute.org It’s not easy being mammal! But you can build your power over your mammalian brain chemicals. Listen! Read! Join the conversation! Music from Sonatina Soleil by W.M. Sharp. Hear more of it at InnerMammalInstitute.org/musicbywmsharp.